Memorial Day Weekend Sales Package – Available Now! Save big this Memorial Day Weekend and decorate your car dealer showroom or your retail store with one of our themed event packages, banners, or hang tag sets. Memorial Day Weekend is coming up fast and decorating your establishment for the holiday weekend could be the extra push you need to drive sales forward. 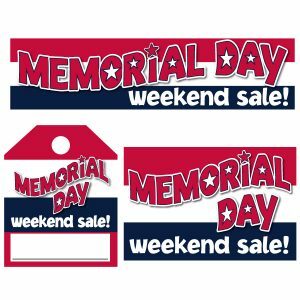 Our Memorial Day Weekend Sales Event package comes with colorful, high impact banners, posters, and hang tags that you can set up as you please to let your customers know that a sales promotion is occurring. Let’s face it, the aesthetics do matter and showing your customers that you took the time to show off your patriotic side for the holiday could be the difference between someone stopping in or passing by.